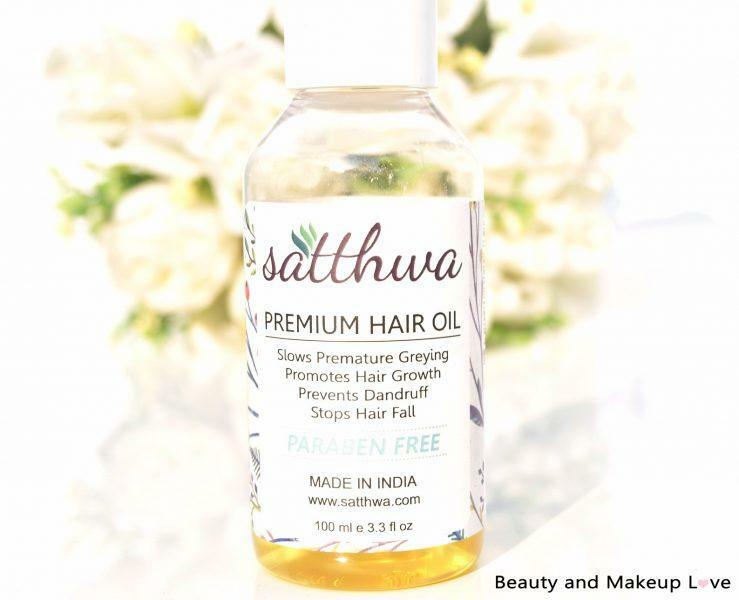 Satthwa Premium Hair Oil: An Oil for All Your Hair Needs! Hair fall is a common issue faced by most women these days, all thanks to our changing lifestyle and chemical laden products we keep loading on our hair, but today I have a very interesting product to share with you all which has helped me reduce my hair fall to almost 60%! Now that’s something really amazing, and I’m sure you all must be excited to know what this product is all about. Well, today I’d be sharing my review on Satthwa Premium Hair Oil which is an all in one oil that works on hair fall, hair growth, dandruff, dry, rough & damaged hair. So let’s just move on to read my thoughts on this oil! Satthwa was started by Prashant a serial entrepreneur who had been fighting hair fall problems since a couple of years. He tried various “big brand” products which only helped a little. After a lot of research, trial and error, he found a good mix of certain oils which made a lot off difference to his hair. He passed on the oil to his friends and family and they all were very happy with the results. Now he is on a mission to help others with this scientifically researched hair oil formula! 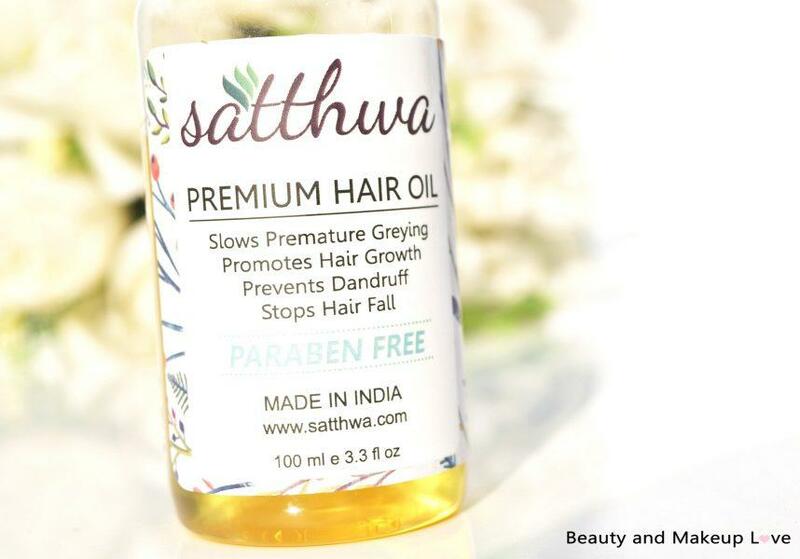 Satthwa Premium Hair Oil is a blend of various oils, vitamins & minerals which is what makes it unique and different from other oils in the market. This oil came on perfect timing in my life, just when I thought I would go bald with this crazy hair fall I was facing post delivery, Prashant (the owner of Satthwa Premium Hair Oil) contacted me and asked me if I’d like to try his oil and give my views on it. I wasn’t very skeptical at first coz I only use a handful of pure, organic oils and no marketed oil coz I know most of them come with mineral oil and parabens in them. Trust me, but I haven’t ever used any marketed oil like those shown in ads as I LOVE my hair and wouldn’t like using those oils with mineral oil being at the top of the ingredient which I know would do nothing but just sit on my hair making my hair sticky for a while and most importantly, mineral oil and those parabens in your hair oil is the reason you might be having hair fall and those grey hair! Go, check the label on your hair oil and blame the Mineral Oil & Parabens in them! 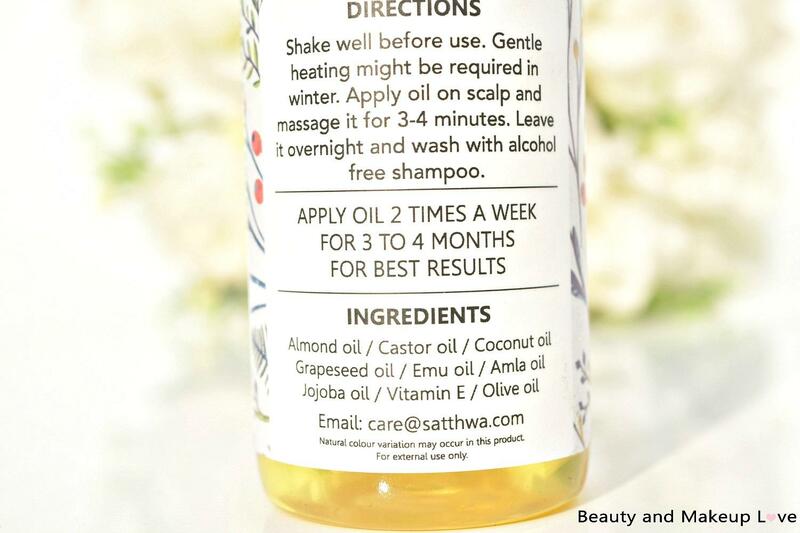 Well, coming back to where we were – So, I wasn’t very skeptical at first but then I had a look at Satthwa website and read what the oil is about and what it is made of (one of my major concerns with Hair Oils! ), I need to know every bit that goes in there as I feel hair oil is the only nourishment we could give to our hair and it should be in the purest form possible! I was super impressed seeing the ingredient list (olive oil, almond oil, castor oil, emu oil, jojoba oil, grapeseed oil, I mean every possible natural oil?) and the list of oils is not just this, it’s super impressive than that. I already use a mixture of olive oil, almond oil, coconut oil, castor oil and lavender essential oil to massage my hair with and when I see one hair oil with a conconation of more amazing oils than what I use, I was like okay, bring it in – I’m trying this impressive hair oil and let’s see what it does to my hair fall! Now, after having tried this hair oil for over a month, I think I was pretty clear on my views on this oil. 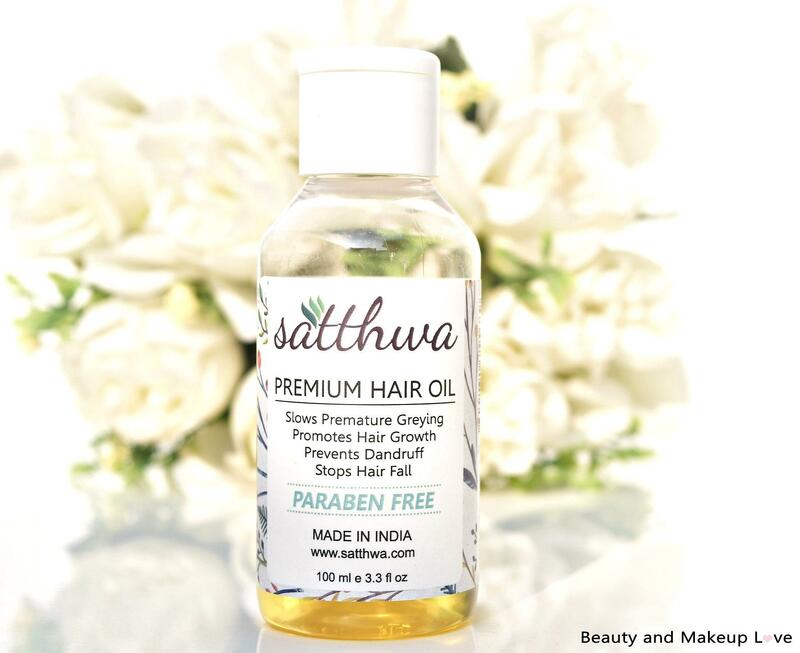 So, the Satthwa Premium Hair Oil comes in a see through plastic bottle with a flip top cap which is quite travel-friendly. The texture of the oil is not thin and it’s not very thick either, it might feel a little thick if you apply it without warming it up but it applies smooth when warmed up a bit! I use this oil after warming it up a bit and usually leave it overnight, sometimes I go over with a blow dryer to help the oil penetrate deeper and work better which is kinda like my lil hot-oil treatment I do with my hair. I wash my hair the next day and the oil gets washed off easily making my hair more mangeable, soft and shiny. I have noticed quite a good change in my hair fall ever since I started using this oil, it does help in controlling hair fall and promotes hair growth (blame it on this oil for fast growth of my hair which I actually didn’t want after having my hair cut, I wanted to flaunt short hair for few months but I’m again back to long hair with this oil :/). If you have slow hair growth, I’m sure your hair would grow faster if you use this oil. It works on dandruff as well as premature greying of hair, both of which I haven’t witnessed since I don’t have dandruff and grey hair (thanks to gooseberry in my daily diet). It works good on hair fall as I’ve noticed less hair fall ever since I have started using it but it won’t control 90% of your hair fall in just a day or a week if you think it might do so, no it takes time and I don’t mind giving time to something I know would work on the hair fall I have been suffering from ages. I have recently seen a bald spot at the front of my head and I’m hoping this oil does wonders in growing my hair back. I still need to give it time as it’s just been a month and it needs at least 6 months of time to grow back the hair in the bald spot tho you would notice a change in hair fall from the 4th or 5th use. I would update this post after one month so you can check it after a month if I was able to grow back hair on the bald spot. The bottle lasts good for a month if you use it twice a week which is quite reasonable. All I can say is, this oil worked wonders for me, today while I was washing my hair, I could see just 30-40 hair strands falling which was 80 last time and almost 200 when I began using this oil and I was pretty surprised (happy at the same time) that I could manage to finally control my crazy hair fall. Castor Oil: Makes hair darker, thicker, stronger and promotes hair growth. Coconut Oil: Excellent oil for dry, rough, damaged hair which works great in strengthening the hair follicles, giving softer, shinier and stronger looking hair from root to tip. Jojoba Oil: Anti-fungal, cleanses the scalp by unclogging pores and promotes healthy hair growth. Amla Oil: Being naturally rich in vitamin C, it helps in making the hair dark, thick and preventing premature greying. Emu oil: stimulates dormant hair follicles and helps in new hair growth. Grapeseed Oil: Promotes hair growth, moisturizes & conditions hair, reduces dandruff, reduces hair fall and makes hair stronger. Almond Oil: Makes hair strong, soft & shiny and treats dry, damaged hair. Vitamin E Oil: Stimulates hair growth, reduce itchiness and makes hair soft and shiny. Olive Oil: Treats dry, damaged hair, promotes hair growth, controls hair fall, works on dandruff and gives softer, shinier, healthy looking hair. Omega 6&9: Stops hair fall Now that’s one amazing conconation of oils I have ever seen, all I used to see on a hair oil was mineral oil, fragrance, parabens, some oils in 5-6% ratio (for which the oil would be marketed) like Almond drops almond hair oil which has only 6% of almond oil rest being mineral oil and fragrance (I mean, why do they even need to bring out such products in market?) and the claims are made like pure almond oil, dafuq! Would like to add here, I’m also using this hair oil on my baby’s hair (who’s a toddler now) as I know this oil is made from the purest of ingredients and is free from all kinds of preservatives, fragrance and other chemicals and I’m amazed how fast his hair grew as his hair growth is super slow and I’m kinda obsessed with long hair on boys, I want to grow his hair till shoulder and this oil could grow his hair till his nape in just a few weeks and also on the front where his hair growth is super slow! I know the post got super long but I wanted to share my detailed experience with this oil, would like to finish off this post by saying that use this oil by warming it up a bit, use a mild sulphate free shampoo if you want to achieve great results as using it with chemically laden products won’t help much!